Mouna Rebeiz is a French-Lebanese artist who lives and works in Paris. I had the great fortune to meet her earlier this year and then, four months later during my recent trip to Paris, I asked her for the opportunity to spend more time with her in her studio. There, the magnificent Parisian light floods the rooms and hallways making her large-scale pieces shine in full splendor. In the image above, Mouna shows me a book with Goya's "La Maja Desnuda" and the diptych on the back wall is her own interpretation of the masterpiece. This is one of Mouna's masterpieces and it's called "Moon". It is such a large piece, I could only photograph it in an angle. Mouna learned her impressive technique with teachers who were 18th century painting specialists at the Musée du Louvre as as well as renowned professors and artists from the School of Beaux Arts of Paris and the School of Beaux Arts of Beirut. Mouna relies primarily on oil-on-canvas using the same brushstrokes that the grand masters from Da Vinci to the 19th Century Impressionists used. 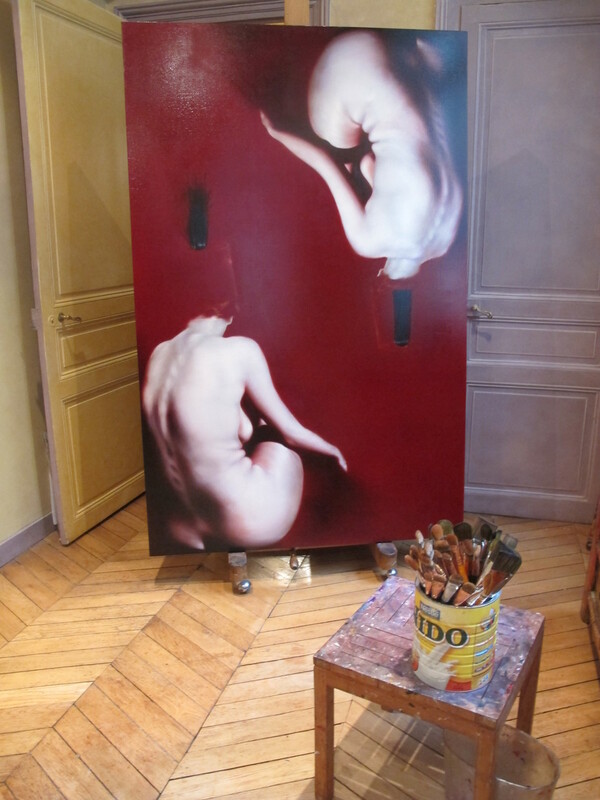 Mouna and her edgy piece called "End" which was developed as an antagonistic position to Gustave Courbet's "Origin of The World". Brilliant. Her pieces are a sensual celebration of the female body, a homage to women’s power and seduction. Mouna is passionate and energetic, her demeanor is fast-paced, she’s sharp and determined, yet her work requires an inordinate amount of time and labor to get to the aesthetic and emotional levels that she accomplishes with her pieces. She first prepares the canvas, then adds some gray tones followed by lights and shadows and then carefully works the most important part: the flesh which is finally sealed with a glaze. I loved seeing a woman who feels so empowered and connected with her own sensuality and femininity and who can paint with such grace and talent. She’s always working and has started a new series of nudes with intense carmine backgrounds that kept my eye and my mind engaged. I can’t wait to see what she will come up with next. This piece is part of the "Three Graces" and the one reflected in the mirror is also part of the trio. This is a canvas that Mouna is currently working on and I truly love it. There is something mysterious and sensual about it that keeps my attention and my eye wanting to go back and look again. Stigma is another impressive, large-scale piece that was magnificently accomplished through Mouna's brush.